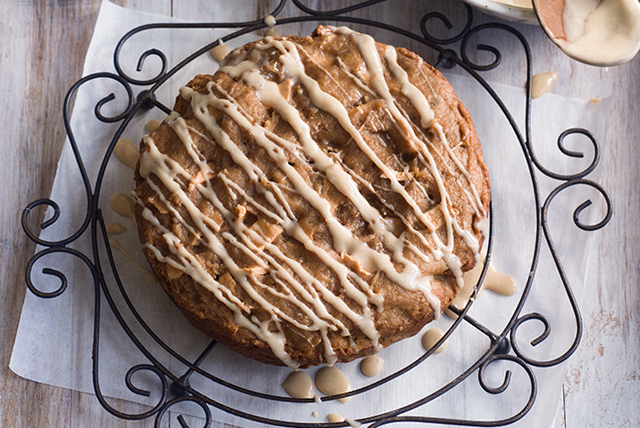 If you're an apple lover, you're sure to love this double-apple cake made in a slow cooker. As of the moist cake isn't enough, the drizzle of cinnamon brown sugar cream cheese adds the perfect finish touch to this mouth-watering treat. Spray 5-L round slow cooker with cooking spray. Place 2 (30-inch) strips of parchment in "x" pattern in slow cooker, extending ends of strips over side of slow cooker. Cover bottom of slow cooker with additional sheet of parchment. Combine first 6 ingredients in large bowl. Mix egg, applesauce and margarine in separate bowl until blended. Add egg mixture to flour mixture; mix well. Stir in apples. Pour into prepared slow cooker; cover with lid. Cook on HIGH 1 to 1-1/4 hours or until toothpick inserted in centre comes out clean. Turn slow cooker off. Let cake stand in (covered) slow cooker 5 min. Use parchment handles to transfer cake from slow cooker to wire rack; cool completely. Mix cream cheese product and icing sugar until blended; drizzle over cake. Add 1/2 cup chopped walnuts to cake batter before pouring into prepared slow cooker and cooking as directed. For best results, do not cook this cake on LOW, but on the HIGH heat setting as directed in recipe.